100% convinced Reid is at the right place. Never doubted. The absolute best thing you can do for your child or yourself is to join the Yonsei Martial Arts Academy family! Fabulous people and a fantastic program that will help you succeed in life! I could not be more pleased with Yonsei Martial Arts! My little girl is loving karate and I get to see her improving with each class she takes. One of the best decision ever. 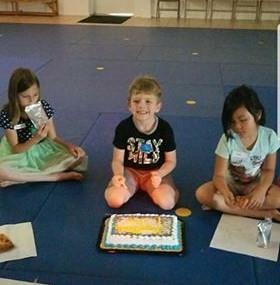 My son enjoyed every class. "I enrolled him for many reasons but one was to help with his shyness. I have noticed a change in just a few classes. He loves it! It's like his home away from home. Thank you!" My son loves training for martial arts at Yonsei. He has developed into the next karate kid. I really like this school, it has helped my child be more discipline and be more positive!!! Disclaimer, I've worked at the school for 13.5 years; however, I've also been a student there for 14.5 years. When I can't be on the mat learning the physical discipline, I've been steadily learning the mental discipline off the mat. It is a great place to learn that martial arts is more than just trophies collecting dust on a shelf. Martial arts at Yonsei is the mental competition against yourself, the greatest opponent, to discipline your mind to train and discipline the body and the spirit. The journey for me is about being satisfied with the current achievements but not so content that I stop evolving and improving. The master instructors are excellent motivators and teachers. It has been challenging and difficult to work and train at Yonsei sometimes, but those moments are usually the best teaching moments for me to learn more about myself. It is an amazing place! Me, my best friend all go there & we love it! They're GREAT with kids. Very welcoming, caring environment where kids learn a ton while having fun. Highly recommend this place! "I was worried that martial arts would promote Michael's aggressive behavior but I found that his attitude has changed. It is more positive and confident. He feels good about himself. He is developing self-control, discipline, and respect for others." Yonsei Academy has given our son a safe, strict and fun place to learn Tang Soo Do. Respect, honesty and focus are a few core values taught. The staff is wonderful with kids. I recommend to friends and family. I made the decision last year to put my son in Yonsei. It was my last hope with out putting my son on medication, because he had so much problems focusing. Mrs. Richard, Don got is last report card and he passed second grade all on his own! I truly believe that karate has helped him passed. The staff is always caring. We appreciate all y'all are doing!!!! The instructors and staff at Yonsei have been fantastic! 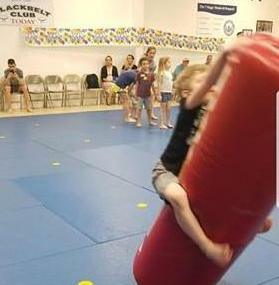 With the physical exercise, self-control and self-defense training that my son is getting, it's definitely well worth the very reasonable cost of enrollment. We only wish that we would have discovered Yonsei sooner. We love Yonsei! Joining this school is one of the best decisions we have made. Connor has really started to focus better in school and be more respectful and empathetic and confident since being at Yonsei. All of the staff are caring and attentive, and outside of training every child's entire well being is important to them. Good people. More geared towards children than adults, but still good. The gym leader works really well with the young folk. My two sons and I are all martial arts students of Yonsei Martial Arts Academy having been so for several years. We love training at Yonsei because of the many lessons, both physical and mental, that are taught there: perseverance, indomitable spirit, respect, self-control, physical fitness, personal accountability and focus, to name a few. The staff at Yonsei is very professional, courteous, and always willing to help students meet their goals, answer any questions, and assist in many ways on and off of the mat. There is great opportunity for personal physical and mental growth if you are willing to commit and put in the time and effort to achieve those goals with the help of the Masters. In addition to the focused training at Yonsei, the school also offers many opportunities for the younger students to have fun through their training by getting involved in the many events during the year that Yonsei organizes such as board breaking nights, water wars summer parties, parents' night out, Yonsei Olympics, Mother's Day and Father's Day nights, etc. I truly look forward to being in class each week in order to better myself in mind, body and spirit. Because of Yonsei, I am committed to making marital arts a part of my lifestyle for many years to come. I can't begin to say what a wonderful experience it has been for my daughter at Yonsei Martial Arts Academy. The Masters and staff truly take interest in each individual child. My daughter has grown tremendously in her three years as a student there. She has become much more self-confident and more able to handle constructive criticism in a positive way. From a physical standpoint, she has achieved great strength, flexibility, and coordination from her training at Yonsei, which I believe has helped her to excel in the various sports she participates in. Yonsei emphasizes strong self-discipline, good manners, respect for others, and personal accountability for one's actions. Enrolling at this first class martial arts school was truly one of the best decisions I have ever made for my daughter. If you are looking for a great martial arts school, look no further! I started there about 3 years ago and I absolutely love it. I was hesitant to try at first but it is worth joining in. I go and train there everyday. The masters are the best. They both specializes on their own style so you're not just limited to traditional kind of Martial Arts. Good people, good family environment. A very solid school. The varied personalities of the instructors provide great teaching coverage for different children's personalities. 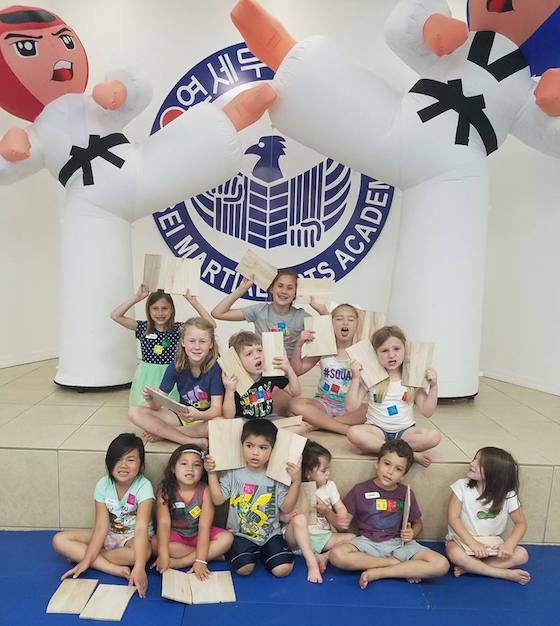 Strong emphasis (and SUCCESS) on manners, discipline, following directions, aerobic exercise -- and of course, martial arts skills. You can be as involved as you want to be. Our childrens' interest has only grown. Very happy we found this school. Yonsei Martial Arts does a really good job with people of all ages. They are good with communicating with their students and you can really tell that they love what they do. Yonsei is the place to go if you want to learn martial arts. This is a great school. What I really like about Yonsei is not only is the instructors very knowledgable but they care about the students being respectful in and out of the school. Thanks to everyone at Yonsei because they made my son feel very comfortable, from the first day until now. I would recommend this school to anyone who's looking for a fantastic karate school for themselves are their children. My daughter loves to go to class. It's her favorite thing to do. They have helped with her behavior issues so much. She has calmed down and can't wait to use her pint up energy at Yonsei. Great school! Excellent instruction by a professional staff...my daughter can't wait to go to another class! They work very well with the youth and take the extra time to make sure they get it right and become strong minded individuals. Yonsei has helped me become the person I am today. Best martial arts school in the New Orleans area!